William Inge was hot stuff in the 1950s. He had four acclaimed plays running on Broadway. He’d won a Pulitzer Prize (in 1953, for “Picnic”). But his work, which leans toward Americana melodrama, has fallen somewhat out of favor. This is perhaps most true of “The Dark at the Top of the Stairs,” which was nominated for a Best Play Tony Award in 1958 and filmed in 1960. It was the last of his Big Four (“Bus Stop” and “Come Back, Little Sheba” complete the list), but despite some historians’ opinions, it’s not his best. The exposition is clunky at the outset, and the resolution is overly neat and tidy at the end. Set in rural Oklahoma in the 1920s, “Dark” concerns two families in distress. Repression is rampant in both — sexual and psychological. One sister is a bit abusive; another is somewhat abused. Cora and Rubin Flood are the couple at the center of the action. Rubin (Alex Guzman) a cowboy turned traveling salesman, is selling horse tack at a time when cars are taking over as the preferred mode of transportation. He exudes aggression, confidence and macho sexuality, but we come to see him as lost and frightened — doing a job that’s become obsolete in a world that’s moving fast and leaving him behind. Predictably, he takes his frustrations out on his family. His wife, Cora (Laura Bohlin), in the meantime, holds her children too close in her husband’s absence. Their 16-year-old daughter, Reenie (Gabi Leibowitz), is pathologically shy, nearly agoraphobic. Ten year-old Sonny (Ryan Singer) is spoiled by his mother, bullied by his peers, and (perhaps gender inappropriately) obsessed with his scrapbook of movie star photos. In the second act, we meet Cora’s funny, coarse, abrasive sister, Lottie (Susan Stratton), whose brash exterior masks her internal ache about her barren marriage. Her taciturn husband, Morris (Fred Harlow), is a hen-pecked cypher. The catalyst for change is Reenie’s blind date for a dance, brought along by the aptly named, flitty flapper-type, Flirt Conroy (Janey Hurley) and her main squeeze, Punky (Alec Apodaca), who never talks, only grunts. Reenie’s date, Sammy Goldenbaum (Gabe Krut) attends military academy. He’s gentle and sensitive, a survivor of parental neglect (his mother is a much-married narcissistic third-rate movie actress in L.A.; he never knew his father). And, a subject of which much is made, he’s Jewish. Ingrained anti-Semitism rears its ugly head, and disaster strikes. Afterwards, everyone is duly chastened and becomes kinder, gentler and more open and understanding, completely obliterating the two preceding hours of near-complete communicative breakdown among a bevy of thoroughly self-involved characters. 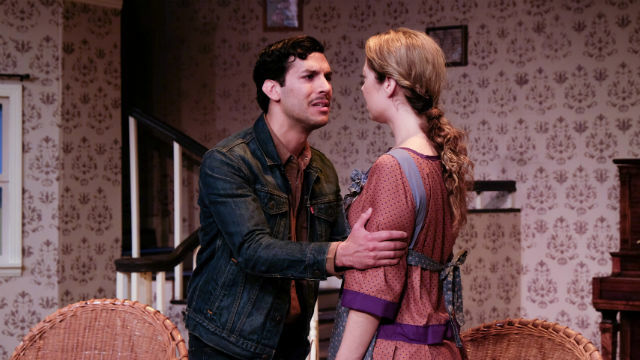 The play is flawed, but the production at Scripps Ranch Theatre is robust and powerful. Director Ted Leib has cast well; the ensemble is solid, each actor striving to fashion a fully-fleshed human out of the sometimes one-dimensional personalities. Standouts Guzman, Bohlin, Stratton and Leibowitz are particularly credible and memorable. Perhaps more so than the play itself, which is dark, as the title promises, but not as deep or symbolic.